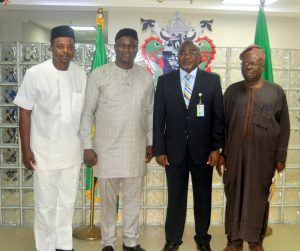 Management of the Nigerian Ports Authority (NPA) has thrown its full support to the formation of the Nigeria Institution of Procurement Engineers (NIProcE) – Lagos Chapter, insisting that the establishment of the Institution would enhance the understanding and effective implementation of the Nigerian Public Procurement Act 2007. From second- right – NPA Managing Director’s Rep Engr Rufai Mohammed, while first from left: The South-West Co-Ordinator, Dr. James Akanmu, Chairman Nig. Institute of Procurement Engr (NiProcE) Engr. Samuel Echedon FMSE and far right is Chairman, CEO, Project Monitoring Consult, Engr. Kunle Ade Wahab during the courtesy visit. While commending the initiators of the Institution, the NPA Managing Director, Hadiza Bala Usman, however enjoined them to propagate the provisions of Procurement Act extensively so that the public sector would be guided accordingly. Speaking through the General Manager, Engineering, Engr. Rufai Mohammed who received members of the Institution, who paid her a courtesy visit in her office on Monday, the Managing Director expressed her appreciation on the Institutions offer to partner with the Authority to ensure the successful implementation of the Act, through capacity building, and appropriate interaction with procurement entities. Hadiza Bala Usman while commended the activities of the Institution since its inauguration in May 2017 particularly expressed her delight to the advise offered by the Institution on ways at avoiding offenses captured in section 58(4) of the Act as well as the responsibilities of the Managing Director in the Act as stipulated in section 16, sub-section 20 and 21 and section 20. Earlier the chairman of the Institution, Engr. (Sir) Samuel Echedom had told the Managing Director that the Nigeria Institution of Procurement Engineers (NIProcE) has now become a hub and focal division of the Nigeria Society of Engineers (NSE) and in pursuit of its objective, have exhibited vibrancy and commitment through organizing trainings, workshops and seminars. He said the objective of the Institution include articulating and formulating more effective and efficient procurement process, assisting government set goal of Economic Recovery and Growth Plan (ERGP), establishing partnership and collaborations with the Federal Government Procurement Regulators, Ministries, Department and Agencies as well as ensuring that Nigerian contractors, suppliers, consultants and other service providers are given first consideration in all matters relating to public procurement by ensuring that the Act are compiled with by all concerned. “As a watchdog, we want to ensure that fairness, equity, competition, transparency, openness, efficiency and value for money is achieved in the Procurement process. We will ensure that salient issues in the Act such as the Procurement Planning Committee and Evaluation Committee are set up in line with the provisions of the Act” Engr. Echedom added. He announced plans by the Institution to host the Institution 2018 Procurement Summit billed to take place on November 3rd, 2018 under the theme “The Role of Public Procurement in the Implementation of an Effective Transport System in Nigeria” at Sheraton Hotel, Ikeja-Lagos.